It has long been observed that the main requirements of any boat are space, speed and low cost, and that while any two of these are possible in a particular boat, all three are not. However, if you are prepared to sail a boat that looks different, and requires a slightly different tacking technique, it can be done. Harrys are definitely different! They are also the least possible boat for a given length, which also makes them potentially the fastest and lowest cost. Speed is about light weight, sail area and minimising drag. No superfluous structure and intelligent infusion means half the structural weight of a cat. Flexible masts allow more sail area in light wind, and self regulation in strong wind. You set enough sail for the lulls, not for the gusts. Drag is reduced as light boats have less wetted surface, 2 large rudders are much less drag than rudders, daggers and cases and a short hull has less aero and hydro drag than a long one. No foredeck work, (or clambering up and around the cabin to get there), flogging sheets, out of control travellers, daggerboards or cases. Rudders that kick up in a collision, masts that bend and depower in gusts, fewer fittings to break, no need to climb the mast to check it, and dinghy stowage and access from the bridge deck rather than from the stern all make harrys safer than conventional boats. Harryproas are much less prone to pitching than cats as the rockerless hulls have very high prismatic coefficients (the ratio of volume in the ends to volume amidships) and all the weight is concentrated amidships, which is also the pitch axis and the location of the crew. The rig also has a lower centre of gravity than a stayed rig. Sailing upwind, the bows of the hulls tend to meet the waves at the same time. This results in a monohull like motion (without the heeling!) rather than the corkscrewing motion typical of a catamaran. Intelligent infusion means precise material alignment, weight and location options with most of the conventional post moulding work included. e.g. doors and hatches, their openings and cut outs for locks and hinges; window rebates; male/female joins for self aligning assembly; rebates and landings for bulkheads and furniture; all edge finishing. These are all done at a nice height, with dry materials and no time stress. Then perfectly wet out and consolidated in 40 minutes. The next day they are demoulded and glued together, ready to paint. Minimal grinding, sanding or fairing. Sailing a harry is a joy. 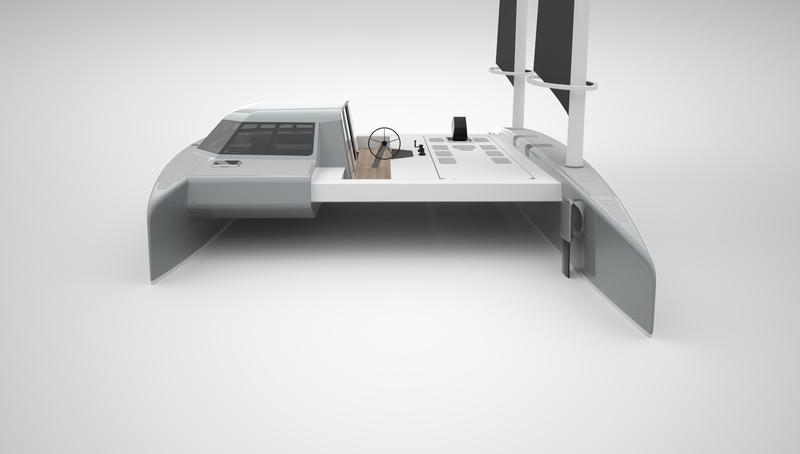 Simple, self adjusting rigs, with minimal controls, no foredeck work, a sheltered steering position with near 360 degree views from where the sails can be seen and trimmed make harry sailing very easy. Shunting is less effort than tacking or gybing and far safer, particularly in big seas/strong winds. Labour is lower due to intelligent infusion. There are fewer materials in a lighter boat. Light boats have smaller rigs, motors and equipment for equal performance. Simplicity in the form of no headsails, spinnakers, daggerboards or stays and all the structure and fittings these require lower the costs further. With much less to maintain, running costs and lost sailing time are also lower.